Those are great goals and it sounds like you're on track! I have my first ever 5k race in June and I also want to be binge free. Do you have a vacuum? Stick your bedding in a garbage bag and stuck the hose I the opening of the bag, sucking the air out. It will get flatter and more shippable. Great work! May first full month of my weight loss journey and it went really well overall. I lost about 20 pounds, yay! Most of it in the first two weeks and now things are going at a more "normal" pace of about 1-2 lbs. 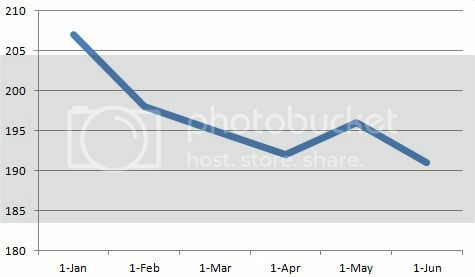 I love the idea of tracking miles over the year, I think I'm going to "steal" that from you! :) Keep up the good work! INVESTING IN SOME OF THOSE VACCUUM BAGS FOR BEDDING AND TOWELS ETC WOULD MAKE THEM MUCH MORE MANAGEABLE. oops sorry for "yelling" lol have you looked into seeing if anyone needs a car driven from cali to chicago? worth checking out. Great goals for June. Unfortunately my May turned out a disaster for weight loss, but I am back on track now. I am down 86 lbs so far and getting closer to goal. Just found your blog. It is very inspirational. I am your newest follower. May was another rough month. I'm ready to not have to say that again. My health/weight has been one of the few consistently good things since we moved. So I guess I have that going for me. In June, I'm looking forward to starting work, finally, after having not worked a regular schedule since December. 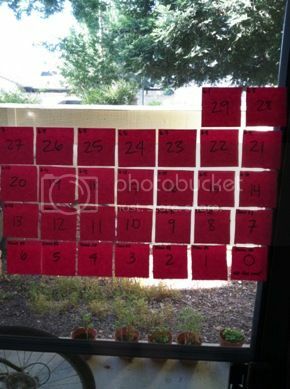 That post-it note calendar is so pretty! I think I did well in May & hope to do even better in June. I feel so motivated. Sometimes it just clicks you know? I can't believe that in less than 30 days you will be back in Chicago. How freaking awesome is that? I think your June goals are doable and I know you will crush them! I think it was brave of you to step out of your comfort zone and give California a chance in the first place. I know you'll find a great job! So many folks are focused only on the timeliness of offers rather than holding out for that right one to come along. Good things come to those who wait! Great job in May Mary. Glad the summer class is working out for you. May was a good month for me. I have finally jumped back on the wagon and my eating is on plan. My goal for June is to start exercising. My weight-loss has stalled the last couple of weeks and I'm hoping exercise is the key to make it start moving again. Crossing my fingers for a job offer to come your way soon.